Andover, MN is home to a variety of stinging insects. If you’re seeing an influx of these stinging critters around your home or commercial property, it may be time to call in the bee, wasp and hornet extermination pros at Eco Tech today. We understand that stinging insects can cause significant risks to your property and even your health, especially if you or anyone in your family is allergic to these insects. Read on to learn more about the different types of stinging insects that you’ll likely see in our area. Carpenter Bee – These bees range in size from around ½ to 1 inch long and have a black abdomen and actually chew through wood to create a chamber to lay their eggs. Bald Faced Hornet – Worker hornets are usually around 5/8-3/4 inches, while queens can be ¾ of an inch or longer. Hornets are usually black with a white patterned face. 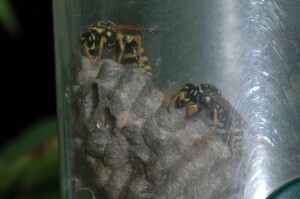 Hornets typically build nests in trees, under eaves, chimneys or behind siding. Paper Wasp – Paper wasps are usually around 1 inch in length, and look very similar to yellow jackets in terms of coloring. They typically build their nests in grills, behind attic vents, inside grills and other semi-enclosed areas. How Do I Get Rid of My Bee, Wasp and Hornet Problem? The key to getting rid of a bee, wasp, or hornet problem is to hire an exterminator. Andover MN residents can expect to see an uptick in stinging insects in spring and summer. If you call in a wasp and hornet extermination team they’ll do their best to get to the nest itself. Killing wasps and hornets one by one is not ideal, because of the large number of insects that can be in a nest. It’s not recommended that you try to get rid of a bee, wasp or hornet nest on your own. A bee, wasp and hornet extermination team like Eco Tech has the experience and knowledge to get rid of your insect infestation in as little time as possible. In addition, we do our best to use organic pest control products to ensure that you, your family and even your pets are safe after our team takes care of your wasp and hornet problem. To discuss your pest control problems with one of our team members, feel free to give us a call today at 763-785-1414, and we’ll be happy to come out to your property to give you a free estimate. Copyright © 2019 EcoTech. All Rights Reserved.